Think about the last time you were traveling and got lost. You had your destination in mind. You had every intention of getting there. But you took the wrong path, and you didn’t end up where you wanted to be. Why do we tend to think that we are the exception to the path principle? Why do we see our choices as individual events, instead of seeing them as a path to a destination? You cannot reach spiritual maturity on a path of spiritual neglect. You cannot reach marital health on a path of marital complacency and unaddressed wounds. You cannot reach financial stability on a path of reckless spending. You cannot reach effective leadership on a path of procrastination, arrogance, or lack of preparation. This isn’t just about our effectiveness as leaders, but the kind of leaders were are becoming. If we manipulate people, hedge on the truth, trample those with less power than us, or compromise our integrity in any way, we have effectively abandoned the path of godly leadership for a path of personal destruction.The principle of the path means that none of our choices take place in a vacuum. Every single one determines who we are becoming. 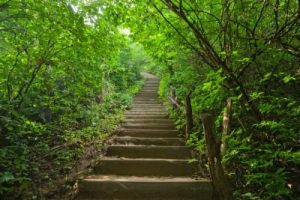 Every single step is in a particular direction on a particular path, so the question we must ask ourselves every day is this: where do I want to go, and am I on a path that will take me there? The Bible talks endlessly about paths, steps, choices, trust, faith and godly principles, because we are all prone to stray off the path of righteousness in pursuit of ‘the new shiny thing’, carefully paraded by the enemy of our souls. Here are some scriptures to encourage each other with this week. Proverbs 4:26 ” Consider well the path of your feet (thoughts, emotions) and your way shall be established”.